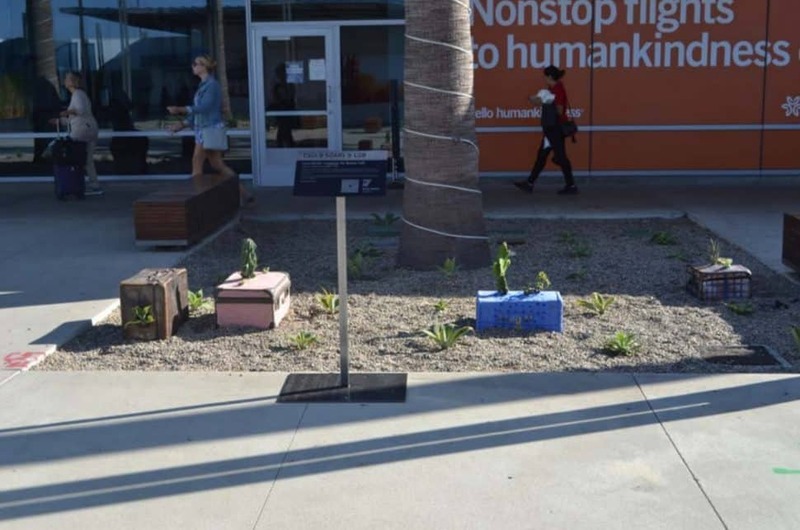 Artist Lena Wolek's installation at Long Beach Airport, "Luggage for native soil". Photo courtesy of LGB. Holiday travelers shuffling through Long Beach Airport can catch a glimpse of what the city’s vibrant arts community has to offer now and through early next year. Currently on display are two installations by artists affiliated with Cal State Long Beach through a recent partnership between the airport and the university. One of the two artworks on view is by Siberian artist Lena Wolek, “Luggage for native soil”, depicting native desert plants growing out of suitcases; a small, sculptural comparison symbolizing the value of migration against the value of settling, of finding a home. 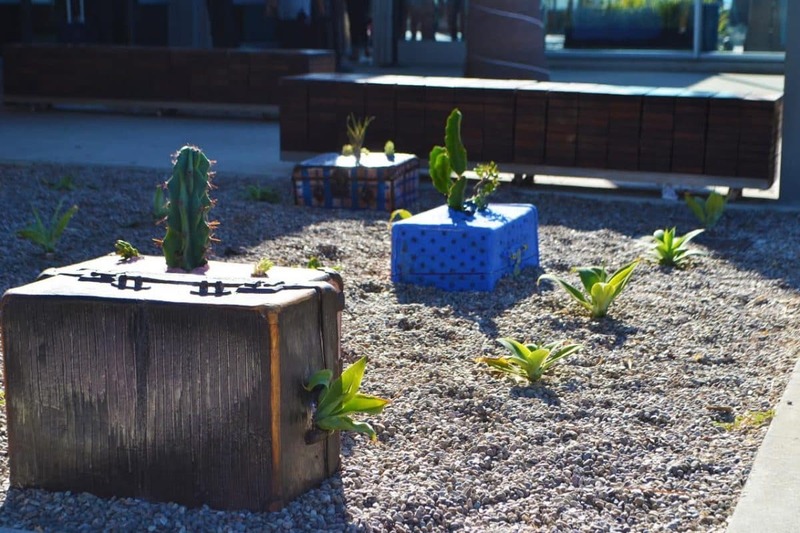 Artist Lena Wolek’s “Luggage for native soil” at Long Beach Airport. Photo courtesy of LGB. “When I came to L.A. from Siberia, I loved the diversity of flora, especially native desert plants that use little water for much of the year,” Wolek said. Fascinated with the sculptural beauty of cactuses and succulents, she started her own garden at home, also intrigued by the fact that these plants would never survive a Siberian winter. Unlike humans, plants are often rooted to the particular climate their ancestors adapted to, Wolek said. Announced in October, “CSULB SOARS @ LGB” (SOAR stands for School of Art Review) is a community engagement effort organized by the university’s school of art and the airport, where college students and recent graduates can show their work to those flying in and out of the city. “For our students and recent alumni, this project was an opportunity to share a refined public art proposal with an actual client,” said Michael Nannery, a local artist who helped coordinate the project for the School of Art. Out of seven proposals reviewed by the airport, four were selected to be displayed. LGB also provided honorariums to the artists to help with covering the cost of labor and materials, according to Nannery. Artist Manny Krakowski’s “The Mountain” at Long Beach Airport. Photo courtesy of LGB. On view for six months in the public plaza between the terminal and the concourse, “The Mountain” by MFA sculpture alumni Manny Krakowski and “Luggage for native soil” by Wolek will be up through the rest of the year, with “Drifting” by BFA metals student Jojo Solo and “Collection” by MFA ceramics student Amy Williams to be displayed in early 2019. 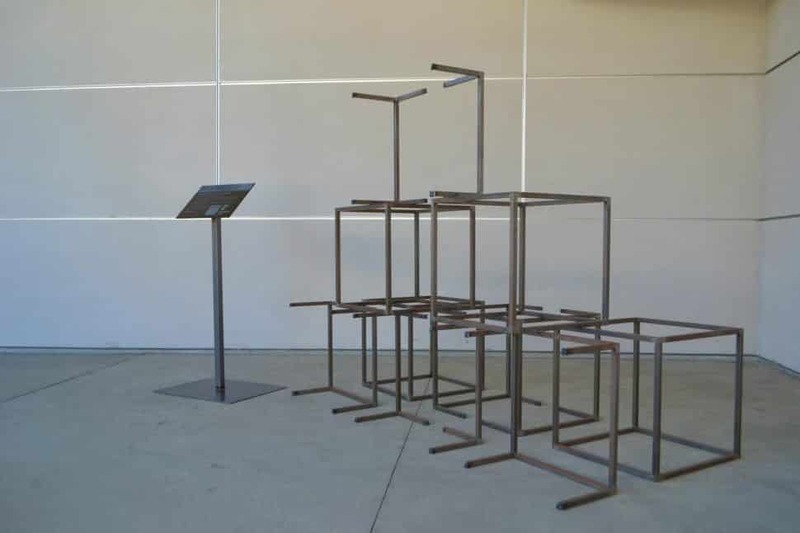 On showing at LGB, Wolek commented on the benefit of being able to display work where a wider variety of people will be able to see it, versus established art institutions which often attract viewers already connected to the art world in some way. “In an airport, everyone who walks by can notice the artwork’s existence and perhaps give some attention, if they have time or desire,” Wolek said.